As you may recall, last week Kimberly got dumped at the Rose Ceremony but came back in to grab Chris. She whiny cries just enough to make Chris feel guilty, who invites her back into the house. The other girls cheer and applaud but you know they're seething inside. 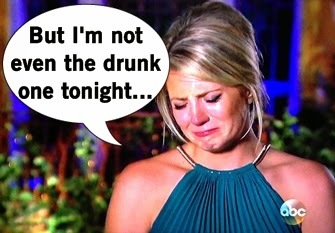 Even Chris Harrison reminds everyone nonstop that they were all drunk and the journey has begun. 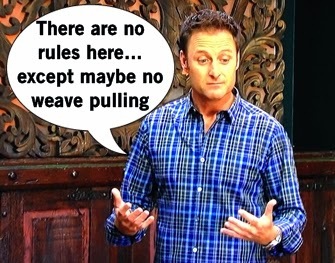 "There's no rules," Chris Harrison explains and I'm expecting a Hunger Games-esque melee. What it really means is breaking into Chris' adjacement man cave to wear his motorcycle helmet. Chris puts on his finest zip up hoodie with no shirt on underneath for easy strip down for a LA rooftop pool party. And they play chicken - how unique! But that's not all, as the girls walk around LA in bikinis until they come upon tractors. Yes, tractors - a bikini tractor race in downtown Los Angeles. Hey guys, Chris is a country guy! And tractors are REALLY slow as the show bumps Footloose music and it's hilarious. Ashley I. wins the traffic race, which means maybe got her machinery to 9mph, and she assumes alone time later Chris. Wrong: he picks 21 year old single mom Mackenzie for the evening one-on-one portion where they just hang out at a restaurant and she talks about his big nose, aliens, and that she's a mom to a kid named Kale. Chris gives Mackenzie the rose and they dance, but she tells us apparently they kissed a lot and the show didn't care to show us. Chris whisks Megan away in a private jet, then into a helicopter over the Hoover Dam. This date is BALLER. So much extravagant air travel and it's only the first one-on-one date! Megan's sob story is that her dad passed away right before coming to the show. Megan clarifies this is a "huge leap of faith" and she's here for the right reasons. Chris adds little depth to the conversation, so he kisses her and the show plays a lot of dramatic music to compensate for the boring date. The final date card says, "Til death do us part" and I got really nervous it was a Heaven's Gate cult situation. CLOSE! The limo pulls into some shanty town and suddenly zombies attack the limo. Everyone straps on some paintball guns to kill some zombie butts. This is one of the cooler dates the shows done in a while and super unique. And it's not farm related! With the beacon found and the zombies date, the champagne is popped and Chris starts "talking" and by that I mean kissing everyone. On her own planet of needing attention, onion-or-pomegranate Ashley S. is a total space cadet the whole date and I can't tell if she's kooky or straight up drunk. Chris can't figure her out since one minute she's coherent and the next she's full crazy. In a seriously awkward moment, she runs in and interrupts Chris' ITM camera interview about his date. 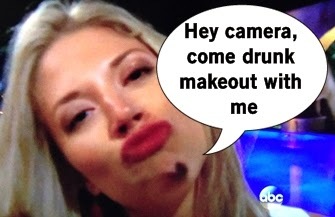 She's a unique creature that surely will return on Bachelor in Paradise. Chris and Britt make out a fair amount after he gifts her a "free kiss" card, but he hits it off with Kaitlyn and gives her the date rose. A bunch of girls were dateless this week, so they rush to get their time with Chris to show they deserve a rose. Whitney brings Chris a bottle of whiskey from home, but I'm not convinced she didn't snag it from the open bar. Secrets are revealed too: Ashley I. is a virgin, but she doesn't want to tell Chris yet. But she does give her three wishes on her belly button ring, which he rubs and wishes for a kiss. It's so gross. "I'm totally cool with it" Britt changes her mind and isn't loving the situation and cries. Meanwhile, Chris is just mackin' it. This has to be a Bachelor kissing record. Who won't be kissed is Jordan, who takes on the shitfaced Tara role of this episode but is totally incoherent in speaking. Good luck getting that rose, Sloppy Jones. Come Rose Ceremony, Chris declares in his speech that he can see his wife in this room. Well kudos that he can see because I think there's one or two that are seeing double right now. The highlight of what is usually a bore is that when Chris calls Juelia, Jillian walks forward AND trips on the carpet. Double dumb! But then it's back to boring as girls are given their roses and eventually some duds don't get a rose. Gone this week are night one drunk Tara, eliminated-a-second-time Kimberly, and I think two other girls that no one remembers. And yes you're reading it correctly that zany Ashley S is still there. There is a reality TV god. Next week: invaded by Jimmy Kimmel.